Leanne came over to the guest house and invited us over to her apartment for dinner, followed by an evening at "the square". We walked over to Leanne's place (about 2 miles from the guest house) and climbed the stairs to the 6th floor. I kidded Leanne about living in the Penthouse as she lives on the top floor of her building. We spent the afternoon looking at photos and letting the children play. Leanne's son Michael is only 1 month younger than Charlie but about 2 inches shorter. While looking at Leanne's wedding pictures I noticed several portraits they'd had made and in each one Leanne had on a different dress. Not only that but it was a different dress than she wore in the pictures taken at her weddings (yes plural...I'll explain later). Apparently it is the custom in China to have you wedding portrait made using the photography studio's wedding attire. Hey sounds like a good idea to me, imagine the savings and you get to wear all kinds of neat clothes! Leanne also told me she was married three times, the first wedding took place in her husband's home town. 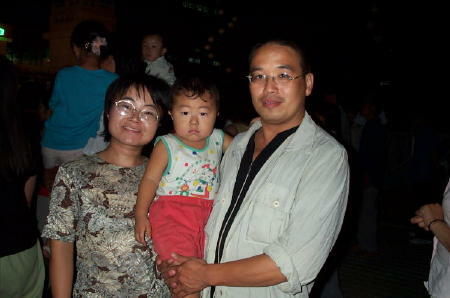 The second in her home town and the third, here in Jinzhou with their friends. Leanne told me on her very first date with her husband, she told him she could not cook. So he does most of the cooking. This is very common I'm told, many men are the primary cooks here in China. Gosh if my husband had been the "chief cook" all we would have eaten would have been breakfast burritos! Her husband (have you figured out by now I can't pronounce, much less spell his name) prepared a wonderful meal for us. We had two kinds of chicken, pork, fresh tomatoes, fresh cucumbers with dip, potatoes, boiled peanuts and rice for dinner! Talk about a feast, it was great! After dinner we walked to "the square" where folk dancing and other performances take place. This evening one of Leanne's private English students was performing. She was giving a violin recital with the rest of her music class. Leanne's student is the second from the left. I don't know if you can tell from the picture, but children appeared to be about 8 years old. They were very good and played about 3 songs. 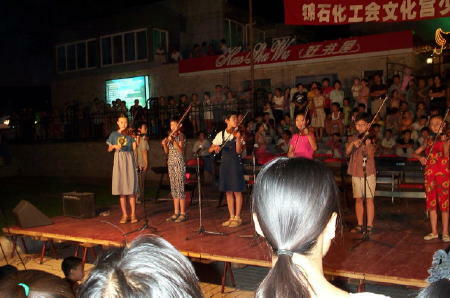 There was no folk dancing this evening, but a few other groups gave musical performances. Part of the square included a children's play area. 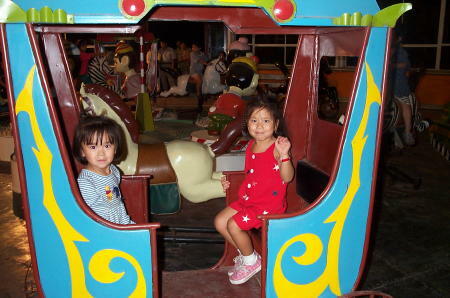 There was a merry-go-round type ride that the kids really enjoyed. 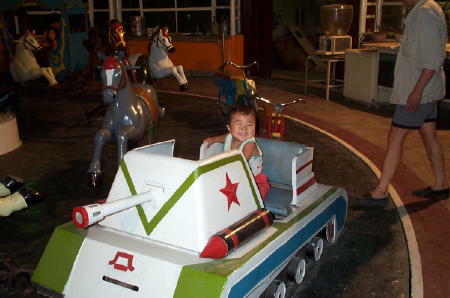 It cost 1 yuan to ride (about 15 cents.) It went around for quite a while at a much faster speed than our merry-go-rounds. We let the kids ride it a couple of times as they were having such a good time. After the ride, we discovered another building with a play area. This area had two trampolines with a ball pit between them and a slide into it. All three of the children had a blast and played in here for about 45 minutes. It was growing late and we had to head back. We took a pedicab home. A pedicab is a kind of taxi, it is a motorcycle (or bicycle) with a cart attached to it. They are usually about half the price of a regular taxicab. It was a wonderful evening spent in Jinzhou with great friends.